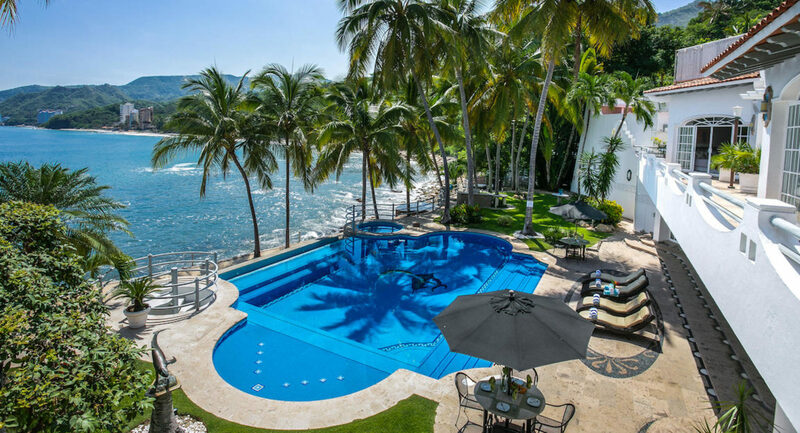 This gorgeous villa will provide the secluded, relaxing retreat that you are looking for. The meticulously landscaped grounds provide a beautiful backdrop to the huge, salt water infinity pool and sand beach. 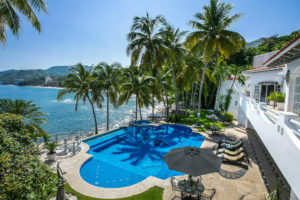 Located on the south side of Puerto Vallarta, this area is internationally recognized as the “Golden Zone of Puerto Vallarta” and is also known as the “Mexican Riviera”. 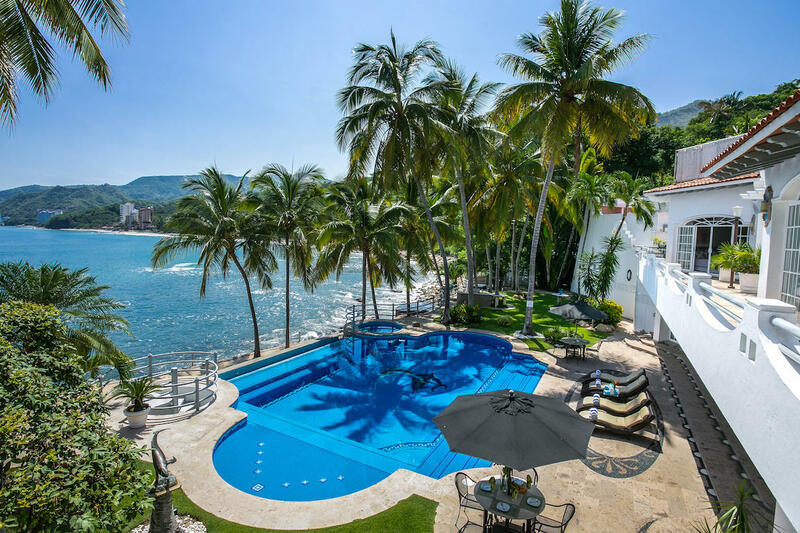 This home is located 7-8 minutes from downtown PV where you can enjoy all the entertainment and fabulous food that this friendly and vibrant town has to offer. With 6 bedrooms and 7 bathrooms, this home has plenty of space to accommodate your large group. All bedrooms have an on suite bathroom and ocean view. The large great room provides a large space for your group to gather while providing an unbelievable ocean view. The outdoor space offers an infinity pool, hot tub, outdoor grill, and sand beach. We include a full staff to make your stay as relaxing as possible. This includes a property manager onsite, daily housekeeping service, and a chef to prepare your breakfast every morning! Additional amenities include: high speed internet, cable TV, free long distance phone calls, AC in all rooms, purified water, concierge services, 2 car garage with additional parking, security system. This home can also be used as a wedding venue with discounted rates with nightly rental. Contact owner for more information. Book this villa for your wedding or event for up to 250 people. There are several different ways that you can utilize the grounds at La Mansion for your event. 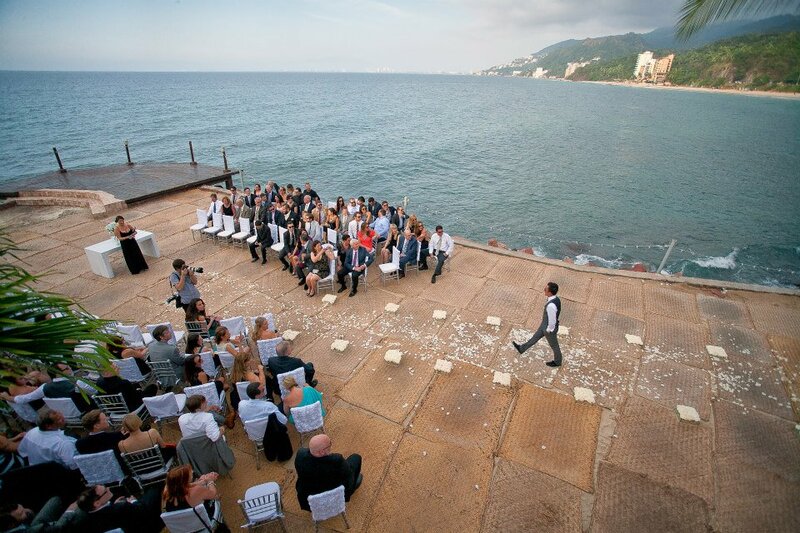 Weddings can be held on the large, sand beach or even by the pool for smaller weddings. The reception can be held by the pool area, with tables set up on the grounds around the pool or on the spacious sandy beach. With a wedding planner on staff, we will make every detail of your special day perfect and stress free. Check out our “Rates and Services” page for more information. For more information, contact us or visit our websites on VRBO (six bedroom) or (five bedroom) for more information!